This set of Foundry Interview Questions and Answers for Experienced people focuses on “Principles of Gating and Risering”. 1. When the gases are trapped in the box, they are not allowed to escape. Explanation: When the molten metal poured into the box, it starts to solidify. It results in the emission of certain kinds of gases which may cause a defect in the casting. Thus is gating and the risering system is provided with vent holes to let out these gases. 2. Which of the following is not a component of the gating system? Explanation: The term gating system refers to all the passageways through which the molten metal passes to enter the mould cavity. Pouring cups, sprue and runners make such passage ways. The pattern is the replica of the component to be obtained is not a part of it. 3. If the gating system is part of the pattern, it avoids cutting a runner and gates. Explanation: If the pattern has embedded gating system, its cost reduces considerably and the sand can be rammed harder. It helps to prevent erosion and washing away from the sand as the molten metal flows into the mold. 4. A gating system can allow sudden or right angles. Explanation: Since the way in which the liquid metal enters the mold has a decided influence upon the quality and soundness of casting, the different passages for the molten metal are carefully designed and produced. Hence the sudden change is direction is not allowed. 5. ____________ is responsible for the prevention of erosion and washing away from the sand. Explanation: Sudden change in direction causes mold erosion due to mold erosion, turbulence and gas pick-up. So Gates are provided to prevent this erosion and washing away of the sand as molten metal flows into the mould. 6.______________ is also called as the feeder head. Explanation: A riser is also called as the feeder head is a passage of sand made in the cope (mould) during the ramming in the cope. The molten metal rises in the feeder head after the mold cavity is filled up. 7. __________ vacuum in the riser leads to a shrinkage void. Explanation: Metals and their alloys shrink as they cool and solidify. It creates a partial vacuum within the castings. Partial vacuum within the casting leads to a shrinkage void. This shrinkage void will grow and form shrinkage cavity if extra liquid metal from outside the mould is not supplied. 8. A riser permits the escape of the air and mold gases. Explanation: Risers promote single directional solidification. When it is full it indicates that the mould cavity is full. A riser permits the escape of air and mold gases as the cavity is being filled with the molten metal. 9. Which is the most common defect caused by the risers? Explanation: The primary function of the riser (attached with the mould) is to feed metal to the solidifying casting so that shrinkage cavities are get rid of. Hence it can be seen that the common defect is shrinkage which has to be avoided. 10. The metal in the feeder head cannot be compensated to the shrinkage as the casting solidifies. Explanation: The molten metal rises in the feeder head after the mold cavity is filled up. This metal in the feeder hear (or riser) always compensates the shrinkage as the casting solidifies. 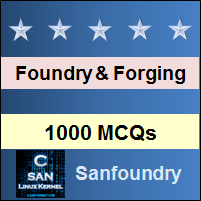 To practice all areas of Foundry for Interviews, here is complete set of 1000+ Multiple Choice Questions and Answers.